Underwater explosions generate high-power, impulsive signals that can provide a source of sound for research on acoustic propagation. Explosive devices specifically designed to generate underwater sound are called explosive sound sources. Explosive sources can provide the high power and low frequencies needed to study the structure of the seafloor and to explore for oil and gas. The signals generated by explosions are capable of propagating over hundreds or even thousands of kilometers. For example, the SOFAR (SOund Fixing And Ranging) channel.The SOFAR Channelwas discovered in the spring of 1944 using 1.8-kg (4-lb) explosive charges dropped from a ship. The signals were recorded on a hydrophone hung from a second ship that was located up to 1667 km (900 nm) from the explosions. Researchers have largely replaced explosive sources with more controlled and safer non-explosive sound sources, although one of the most commonly used underwater explosive sound sources, the 0.82-kg (1.8-lb) SUS (Signal, Underwater Sound) explosive charge, is still in use. Current marine seismic research and oil and gas exploration use pneumatic systems, such as airguns, which also produce impulsive signals. 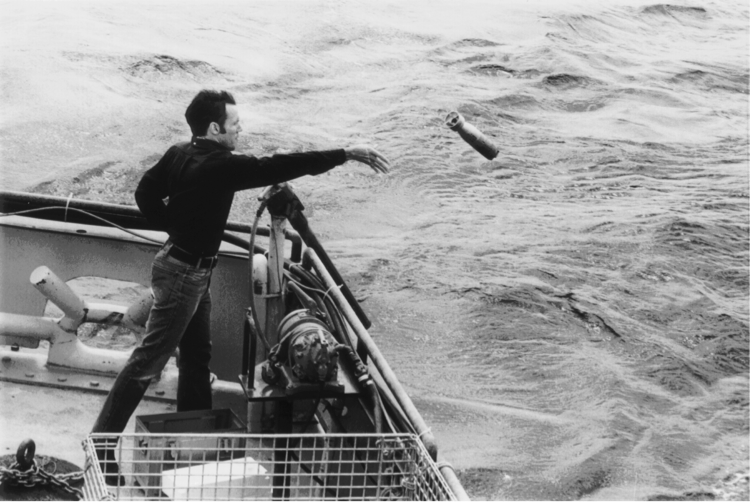 A 0.82-kg (1.8-lb) SUS (Signal, Underwater Sound) explosive charge being launched by Dr. Peter Worcester from the R/V Oceanus in 1979 for underwater acoustic research. Launching a SUS in this manner is no longer performed due to modern safety regulations. A typical SUS charge contains the chemical compound TNT. A chemical explosion starts with an extremely rapid reaction that generates hot gases at temperatures near 3,000°C (5,432°F) and pressures close to 50,000 atmospheres. The pressure difference across the gas-water interface causes a shock wave, which moves outward at speeds greater than the speed of sound in seawater (~1,500 m/s). The shock wave consists of a nearly instantaneous increase in pressure, which then rapidly decays. As peak pressures increase, so does the speed of the shock wave]. The peak pressure in the shock wave increases as the weight of the explosive increases. It decreases as the shock wave moves away from the source. The hot gases from the chemical explosion also create a large, oscillating gas bubble in the water. The shock wave and the gas bubble each contain approximately half of the energy produced by the explosion. After the gas bubble is formed, it expands until the pressure inside the bubble is lower than the surrounding pressure. At that point the bubble begins to collapse, causing the pressure inside to increase. This increase in pressure eventually causes the bubble to stop collapsing and to expand again. Pressure pulses are generated when the bubble begins to expand from its minimum volume. This bubble oscillation continues and creates a series of pressure pulses called bubble pulses. Each successive pulse is weaker than the preceding one. The peak pressure of the second bubble pulse is only about 1/5 that of the first bubble pulse. The energy of an explosive sound source is broadband, but dominated by low frequencies, particularly at distances away from the source. The largest peak in the frequency spectrum of the signal from an explosive sound source is at a frequency equal to the reciprocal of the time interval between the shock wave and the first bubble pulse, called the bubble frequency. 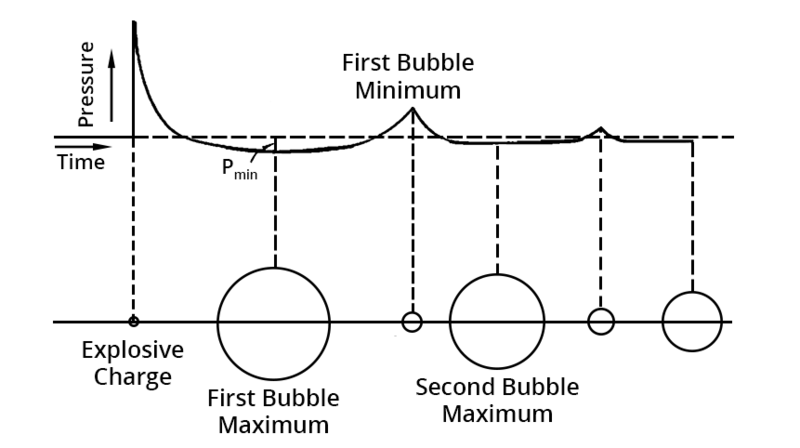 The bubble frequency therefore increases as the time interval becomes shorter. The time interval between the shock wave and the first bubble pulse for a 0.82-kg (1.8-lb) SUS charge detonated at a depth of 18.3 m (60 ft) is about 0.12 seconds, giving a bubble frequency of about 8 Hz. The bubble frequency increases as the depth of detonation becomes greater, but decreases with increasing charge weight. Most of the energy at higher frequencies comes from the shock wave. A video of explosions in an underwater test tank. Video curtesy MITvideo – video.mit.edu. In an explosive shock wave, the rapid, extreme increase in pressure followed by a decrease to below ambient pressure can cause injuries if the pressure differences exceed the tolerance of an animal’s tissues. The shock wave dissipates with distance away from the source, until only a lower energy sound wave remains. Underwater Explosion Phenomena (February 1943), Prepared by David W. Taylor, Model Basin, U. S. Navy. (Unclassified, July 1, 1947). Medwin, H., & Clay, C. S. (1998). Fundamentals of Acoustical Oceanography. San Diego, California: Academic Press.